My son, my brother and I play in a band every Sunday at our church, Our Lady of Malibu. You can see a little slice of the ocean when the church doors are open. One Sunday, I started daydreaming during the sermon and began looking out at the ocean and thinking the whole spiritual experience should go out the church door and also encompass the ocean. As my daydream unfolded I began to hear Surf Music. That summer, I went to France for a vacation with my wife and children along with some other families we knew well. I invited my mother to come along as it was the first summer she’d been alone since my father died. We rented a big bus and all four families toured the coast of Western France. As we drove along, every time I would look out at the ocean, I’d hear some of the Mass prayers as Surf Music. I began writing it down. This project has taken on a life of it’s own since its inception. Originally the idea was just an exercise to see what it would be like combining two musical disciplines, the structure and discipline of a Mass and the discipline of the Surf Music idiom. The “discipline of the Surf Music idiom” may sound like an oxymoron, but before embarking on this voyage, I had to set the parameters of “What is Surf Music?” I won’t burden you with the machinations I went through on this, but the bottom line is I decided that if instrumentation and vocal harmonies existed within the body of currently accepted Surf Music, then that would suffice at the definition for my purposes. For me the ocean has always been a very contemplative image. When I’m in the ocean, I can’t help feeling that I’m part of something bigger and something beautiful. The force behind a wave is tremendous. If you try to fight it, you’ll never be able to ride it, but if you let yourself go and surrender to it at just the right moment you can be one with it. I thought that if I could express that feeling through ritualization, it just might work. Right off the bat, there were several challenges. For openers, much of the Mass (and for our purposes I’m talking about the “musical” Mass) is composed of set prayers. These are prayers, not poems. They don’t rhyme, they don’t scan. There’s no particular meter. You can’t change the words and, of course, they don’t follow any type of song structure, like verse, chorus, bridge, etc. The challenge, then, is setting the prayers to music, and at the same time making the listener accept them as songs and not words stuffed into music at the expense of melody. Next, there are certain Mass parts that require lyrics as well as melody. This solves the problem of song structure, but what about content? The first tunes I wrote and demoed were the prayers, “Lamb of God” and “ Holy, Holy”. I was pleased with the results but I figured that I’d better play it for a clergyman before proceeding. The then interim pastor of Our Lady of Malibu Church was Monsignor Joseph Pollard. Besides being pastor, Msgr. Pollard was a noted biblical scholar, an advisor to the Cardinal; and the exorcist for Archdiocese of Los Angeles. This clearly was a good place to start. Msgr. Pollard reacted very strongly and favorably to the songs. He said he knew nothing about Surf Music, but really felt himself inside of a wave when listening to the tunes. More amazingly, he said he wanted to show me a passage in Bible which came to mind to him while listening to the tape. It was a section of the Old Testament Psalms. Basically the passage said, “ ...and God created the dolphins to teach man how to make sport in the waves...”. This really struck me as it appeared to be a direct reference to surfing in the Bible! He then told me that he thought I’d find something interesting in the Book of Daniel, specifically, the Benedicite. This was a set of verse which was filled with images of the ocean and the environment. The Benedicite was just what I needed to supply the content for my entrance and recessional hymns. This was also the start of a continuing phenomena with this project; playing someone a tune, and their reaction to that tune inspiring me to write another tune. After the Benedicite was written I decided to try it out on our new pastor, Father Bill Kerze. I gave him the tape and I was surprised when a stranger stopped me after Mass the following Sunday. It was Fr. Bill’s brother Michael. Michael is a professor of religious studies at Occidental College. Mike told me his brother liked the tunes so much he gave him a copy. Mike was fascinated by the music and the concept. We discussed the piece for a while, and then he asked me if I knew that the name Mary (as in Christ’s mother) was the Hebrew word for ocean. This seemed plausible since I knew the Spanish word for ocean was “Mare” and “Mary”, “Mare” didn’t seem like much of a stretch. Then he said it specifically translated out to “bitter water”. That really got me thinking. Naturally, “salt water”, “bitter water”, but more than that. The ocean is the origin of life, but it can’t sustain human life. Mary was the origin of Christ’s life, but she couldn’t sustain His life and had to watch Him die. There was definitely something “bitter” in that image. The seed for a new tune had been planted. My wife Joan and I had a friend who happened to be a nun. Her name was Sister Miriam Drumm. Sr. Miriam was an activist and had her hands in many pots, from the Malibu Labor Exchange to Centering Prayer Meetings for women. She also had terminal cancer which she succumbed to last year. One day we went to have tea with her and I played her some of the tapes. I also told her about the image I had gotten from Mike Kerze about Mary and “bitter water”. She simply replied, “That’s me, my name, Miriam, is the Hebrew word for Mary.” She then directed me to the Book of Exodus and showed me the passage on Miriam and the “bitter water”. I went home and wrote the song, “Bitter Water” which became the Responsorial of the Mass. After demoing a few more tunes, ( and buoyed by the favorable response I’d been getting even from my children and their pre-teen friends ), I decided to try it out on someone older. Monsignor John Sheridan is the pastor emeritus of Our Lady of Malibu. Irish born, the 83 year old Msgr Sheridan, is an internationally known religious author and lecturer. He is also one of the most humble and spiritual men I have ever met, and being Irish, I knew his innate love of music would give me a little edge in expanding my demographic. a man who became a priest late in life. He tended a community of mentally retarded adults in upstate New York. He wrote about the contemplative aspects of human spirituality. In one of the chapters in the book, Msgr. Sheridan gave me, Fr. Nouwen concentrated on the concept of being “blessed and broken”. The idea was that the deepest blessings came when you experienced the reality of hitting bottom, your spirit broken. The analogy of a wave not reaching it’s maximum strength until it breaks occurred to me and my Offertory Hymn, “Crest, then Broken” was born. “Crest, then Broken” was recorded in two parts, the first acapella and the second instrumental. Part of the inspiration for the instrumental section also came from another source. Paul Ashton is the “service advisor” at the car dealership I go to . Paul is Indian, but grew up in Australia playing in rock bands until he came here to find work. He is Hindu. With the Mass format and the Old Testament references, I figured I had the Judeo-Christian camp covered, but how would this translate to people with other religious traditions? Would there be a common spirituality in the image of the ocean? Paul really got into the music and asked to take a copy home. The next time I saw him he presented me with a copy of the book, The Eternal Ocean of Brahma by Hama Sood. In her book, Ms. Sood has taken different patterns of pebbles, which have washed up on the beach, and correlated those shapes with some of the teachings of Buddha from the Bagavad Gita. Her vivid descriptions of these pebble patterns really created a cinemagraphic experience for me which came out as the instrumental section of “Crest, then Broken”. I still was looking at this as kind of a personal project. Maybe when and if I finished I’d print up a few CDs for family and friends. It was about this time that I met Walter and Gaston Georis from The Sandals. The Georis brothers wrote and recorded the surf classic, “Endless Summer Theme” for the Bruce Brown movie of the same name. They now lived in Carmel and ran a restaurant, a winery and a Surf Record label called Tri-Surf. They had been distributing our Christmas CD in Northern California and wanted to know if I had any other Malibooz product for them to distribute, especially something a little different like the Christmas album. I told them I had something a lot different and played them the Mass. They instantly flipped for it and asked if I’d consider signing to Tri-Surf and recording LIVING WATER. I was amazed that someone wanted to invest their own money into what I had considered to be a personal exercise. Unfortunately, it was not to be. Just before recording was to begin, Tri-Surf hired a new president and, while she really liked the music, she had no idea how they would market it. A few months later, I was reading an article in Music Connection Magazine and spotted the name of an old friend, Richard Dashut. Richard was Fleetwood Mac’s producer, had co-produced Walter’s first two Columbia albums and had co-produced a tune on my solo LP. Richard was in the magazine article because he had just started a new record company, Orchard Music. I rang him up and he asked what I’d been up to. I told him about a few movie projects and then when I mentioned the Surfer’s Mass, he asked me to bring it my his studio so he could hear it. On first listening, he decided he wanted it on his label. I told him about what had happened with Tri-Surf and asked him if he had any ideas on how to market it. He said he didn’t care about marketing, he just loved the music. There were two acts ahead of us to make albums and then we’d go into the studio. We were especially excited because Richard’s chief engineer and partner was Neale Heywood. We had worked with Neale on our Christmas CD and knew he was professional, easy to work with, and had great expertise with vocals and Surf Music in general. Unfortunately, Orchard Music succumbed to the pressures of the music business and my project was orphaned again. As Christmas approached, I ran into an old friend, Greg Lewerke at a party at the House of Blues. Greg had been Walt’s manager and had subsequently the Malibooz in the early ‘80s. He was now president of Triad Records, the record division of Triad Pictures. I told Greg about LIVING WATER, we went back to his house and listened to it and it was a go. Finally we got into the studio and started cutting the album with Neal Heywood engineering. One my strangest experiences came during the mixing of the album. Working with engineer Neale Heywood, we were very happy with the mixes until we came to “Holy, Holy”. One of the challenges of writing a Mass, is that the songs must be in a particular order. You can’t sequence them, like you would on a regular album, and have songs follow each other which work well together. The songs we had mixed to this point, all seemed really special, but while the mix we were getting with “Holy, Holy” was good, it wasn’t great. Worst of all, the track didn’t work well with the songs before or after it. We had recorded on 4 ADAT digital recorders, each with 8 tracks, for a total of 32 tracks. Every time we would do a mix, we would have to rewind all 4 machines which would then sync-up and then play all 32 tracks back simultaneously. After some frustrating mixes, we finally decided to try one last one before moving on. We rewound the 4 machines, but one was late syncing up. This put one bank of 8 tracks about 8 bars out of sync. Our first impulse was to curse the machines, but then we listened. The out of sync 8 tracks created odd, but beautiful harmonies with the other 24 tracks which were still in sync with each other. We had our mix! It was almost as if the Man upstairs came in and said if you can’t figure out how to mix this I’ll have to mix it for you! 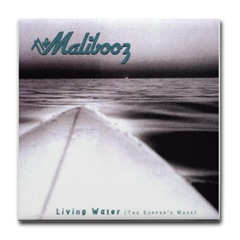 “Bitter Water” from LIVING WATER ended 1999 as the #1 MP3 download at Indiespace and CD Magazine named LIVING WATER one of the top 5 CDs of the year. Currently, 3 songs from the album are performed by The Malibooz in the Christmas TV Special, A MALIBU CHRISTMAS. My father died in December of 1992. Being his oldest child, my father’s passing got me thinking about my own mortality and what, if any, connections there were with the eternal. My then barely 5 year-old son, Johnny, reacted to his Grandpa’s death by saying, “Wow, now I personally know somebody in heaven!” The simple faith implicit in this child’s thought was very comforting to me and it set in motion a chain of events which would cause me to explore my own spirituality. Go Back to the Albums page.